"The healthy and well-educated man is a happy man." Beauty arises not from a beautiful body but from beautiful actions." "Expect the same behaviour from your children as you showed your own parents." "The skilful man is superior to the strong man." "Don't come to a conclusion before listening to both sides." "A small spark is enough to burn down a whole forest." The origins and earliest history of Miletus are still a subject of controversy. The name "Milawanda" that occurs in Hittite texts may well refer to Miletus. The excavations undertaken so far have reached as far as the Bronze Age. The first excavations were conducted by the German archaeologist Theodor Wiegand but these were several times interrupted by wars and various other events. Excavations were resumed by Gerhard Kleiner and continued by Werner M�llerWiener. The history of Milet��s can be traced back to the 2nd millennium B.C. Settlers from Crete arrived here in 1500 B.C., to be followed by the Mycenaeans froin mainland Greece, who fortified the city. According to ancient Greek a��thors, the first inhabitants were the Carians and Lelegians. After the capture of the city by the Ionians under their leader Neileus in 1000 B.C., the conquerors killed the Milesian men and married their wives thus forming the new population of the city. Legend has it that the women of Miletus expressed their resentment and punished their new husbands by refusing to sit at table with them. The city was ruled for a time by kings descended from Neileus, but after 800 B.C. administration passed into the hands of the aristocracy. After 687 B.C. it was ruled by dictators known as "tyrants", and it was during this period that the city began to found colonies overseas. By the first half of the 6th century, Miletus, thanks to these colonies, possessed a large maritime empire. The distinguished scholars produced by the city at that time included natural philosophers such as Thales, Anaximenes, Anaximander and Hecataeus. Thales, the first to forecast an eclipse of the sun, produced new theories in geometry and astronomy, Anaximander carved on stone universal laws independent of the gods and Hecataeus excelled in geography. Miletus had a special agreement with Croesus, but after the collapse of Lydia in 547-546 B.C. the city came under Persian hegemony. After the Greek victory over the Persians in the naval battle at Mycale in 479 B.C., Miletus was rebuilt on a grid plan with the help of the famous Milesian architect and town-planner Hippodamos. After 402 B.C. the city came entirely under Persian rule and in the 4th century was ruled by Carian satraps subject to the Persians. In 334 B.C. Miletus was captured by Alexander the Great. Following his death it was subjected by Antigonus in 313 B.C. and the Seleucides in 301 B.C. The city regained its independence in 188 B.C. In 133 B.C., when the Kingdom of Pergamon was incorporated in the Roman Empire, Miletus became part of the province of Asia Minor. The city declined in size under Byzantine rule, shrinking to the area occupied by the castle known as Palatia to the rear of the theatre. In 1328 it came under Seljuk rule, after which it continued to exist as the small village of Balat. The first monument one encounters on entering Miletus from the south is the Temple of Athena. Built in the first half of the 5th century B.C., it has six Ionic columns on each of the shorter sides and ten on the longer sides Immediately to the north of the temple lies an agora from the Hellenistic period, while to the east of the agora is located a Roman stadium built in 150 A.D. A little further to the north is a theatre dating originally from the 4th century B.C. 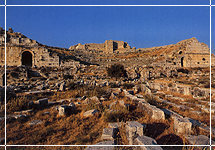 Although it underwent extensive modifications on three occasions, it is one of the best preserved theatres in Anatolia. The remains of the building, with its entrances and vaulted corridors, display all the distinguishing f~atures of the Roman period. To the east of the stadium are the baths of Faustina and, adjacent to the baths, city defence walls dating from the reign of the Emperor Justinian. There is also a Serapeum, or temple of Serapis, from the 3rd century A. D . From here one arrives at the southern agora built in the Hellenistic period with shops in the southern and eastern wings. The monumental gate in the north-eastern corner of the agora leads into the city centre. The richly decorated nymphaeum that stood in the vicinity of this gate is now preserved in the Pergamon Museum in East Berlin. To the west of the nymphaeum there is a bouleuterion dating from the 2nd century B.C. capable of accommodating 1, 500.